"It was a pleasant surprise how quickly the productivity changed"
Retail Distribution Center shipper labeling area. gadzooks uses scanners and a print-and-apply system to automatically generate labels for cases shipped by FedEx to 433 stores. gadzooks, Carrollton, TX, ships cases of teen-oriented clothing and accessories from its distribution center to the chain's 433 stores. For years, the FedEx-approved label had been printed and hand-applied. Logistics and distribution director Paul de Freitas says that manual arrangement relied too much on workers "babysitting" boxes through the system. The corrugated shippers no longer have to be babied. The labeling system installed by Cisco-Eagle and started up in June 2002 does that automatically. The boxes arrive at the system with a preprinted label already affixed. 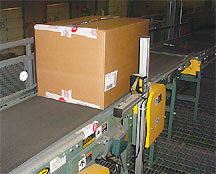 The system scans the label, and based on that information, a FedEx shipping label is created and affixed to the case. Then the new shipping label is verified by a second scanner. Between the two scans, the box is automatically weighed and strapped. The hardware on the new 44" long straight line section was supplied through Texas Barcode Systems. That includes two Datalogic bar code scanners, a Weigh-Tronix in-motion scale, and a Model 5200 print-and-apply labeler from Weber Marking Systems equipped with a Zebra Technologies print engine. The system is run by a new Dell personal computer on an existing communications network. The conveyors, manufactured by Hytrol, were supplied through Cisco-Eagle, which also engineered the communications. The line was installed on a 9"-high steel platform that was part of the building structure. Packed with clothing, handbags, belts, shoes, or other accessories, boxes arrive at the labeling system in single file with a preprinted product label affixed to their side. That label carries internal tracking information using a unique product identification number and a Code 39 bar code, which de Freitas says is a non-FedEx symbology. That label information is read by a Datalogic Model DS4600 fixed position scanner at the entrance to the system. De Freitas calls this the induction scanner and the one at the end of the line that confirms the FedEx label the verification scanner. The scanner reads the label and sends that information to the PC, which creates data for a new label that it relays to the Weber print-and-apply unit. The scanner is mounted three-quarters of the way along a 12"-long "gapper" belt conveyor from Hytrol. This conveyor section comprises a slower conveyor followed by a faster section that runs at four times the speed of the slower conveyor to properly space the boxes ahead of the scanner. After scanning and before labeling, the box is weighed by the Weigh-Tronix Model CVC 4824 in-motion scale; the weight is sent to the PC to be included in the data transmitted to FedEx, though the weight is not required on the label. The 6"x4" pressure-sensitive labels are manufactured by TBS as rollstock. The label is printed with all required FedEx data elements. The label is indexed to the tamp-blow mechanism that applies it to near the middle of the side of the passing box when the box trips a photoeye. The label is applied oriented horizontally 16" from the box's leading edge and about 8" from the bottom. The typical box is 30" long, though gadzooks also periodically runs odd-sized boxes through the system. If the scanner cannot read the bar code, it generates an error label. Those boxes is directed toward a rework conveyor loop located after the second scanner. Next, the boxes are secured by the Japanese-made strapping machine from Samuel Strapping Systems that was installed as part of the upgrade. De Freitas says the boxes are strapped with bands of extruded polypropylene because gadzooks' average box weighs 45 lb, too heavy for tape alone. Besides, strapping is cheaper than tape, he adds. Tape secures the top flaps, along with a hand-applied cross-section of tape, for security reasons. A photoeye mounted on the strapper ensures another box isn't conveyed for strapping until after the strapping cycle is completed. "The strapper has been a great machine," says de Freitas. 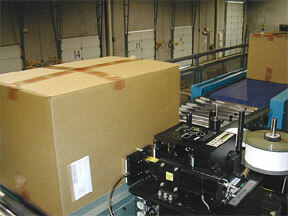 Cases are then conveyed past a Datalogic Model DS2100 scanner that verifies that the FedEx shipping label is present. According to de Freitas, two conditions will cause the system to automatically shut down after it scans the label: If there is no FedEx label present, or if the label's bar code is unreadable. The scan is triggered when the box is sensed by a photoeye. Cases are directed toward one of two outbound conveyors used in the prior set up or to the reject loop that separates rejected cases for workers. Before, gadzooks' personnel manually scanned the boxes and attached printed labels. De Freitas says that five full-time positions have since been reduced to two or three, depending on demand. "Labor savings is where we really get the bang for our buck," he says. "This is a huge improvement -- we don't have to have people there "babysitting" each box." Simultaneously, gadzooks' fulfillment rate was bumped up from 4-5 boxes/min to 7-10 boxes/min. An even more telling figure is efficiency, which gadzooks tracks by cases per man hour. Before the change, that figure was 24 to 28. The first day the new labeling line was in operation, gadzooks' efficiency jumped nearly 50% to 46 cases per man hour. "It was a pleasant surprise how quickly the productivity changed," de Freitas says. Since then, things have only gotten better: gadzooks now consistently operates in the 50 to 60 cases/man hour range. De Freitas admits that the system is not perfect; he places the error rate of mislabeled boxes at less than 1/10 of 1%. For comparison, the rate in the more labor-intensive previous set up was near zero. The bottom line for gadzooks is a highly fashionable one-year payback. Another bright spot has been that store managers have been oblivious to the change. "It was seamless to them," says de Freitas. While fashion trends come and go, de Freitas expects years of dependable operation with the labeling system.